Appearance (Image or short description. 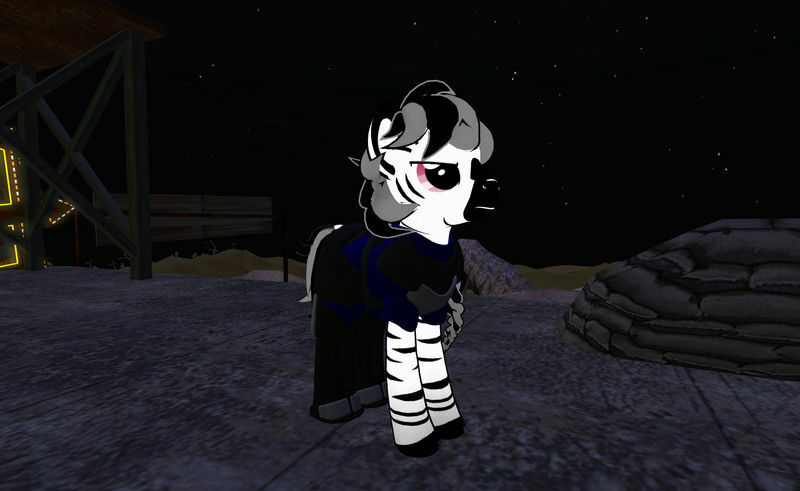 ): A young Zebra stallion with with a gray and black mane and tail. He has rose colored eyes, and often scruffy fur from long term wandering about the wastes. He wears blue cloth with black leather and light armaments that don't restrict his movement. Biography/Brief History: Dirk is a Zebrican student of Fallen Kaiser style hoof to hoof fighting. He fights as an heir to the art, and works to perfect it while preserving his own morals. The zebra has spent his entire life traveling the roads with his father, whom taught him the art. To him, he holds these fighting skills above all other things. More so since his father's passing. He has come to Tumble Weed in search of a place to train, hone his art, and expand his horizons. While he holds his art to be his current purpose in life, he often is found to be snarky and overconfident when in a 'fair' fight. He has been known to practice against creatures of the wastes to bolster his skills. And while not as 'extensive' a student in alchemical arts, he does know enough to survive in harsh conditions, and aid those whom he comes across at times.